Slowly, but surely, Yuki and Neva have sorted out who is the boss (Yuki is the boss) in the four weeks since we brought our puppy home. Don’t worry, Neva has never wanted to be the boss of anyone and she seems to enjoy having someone in charge. It’s most evident on the field after Neva has chased the tennis ball a bazillion times and is ready for a big drink of water. We pour the water and Yuki, who only gave chase 2.5 times and isn’t all that thirsty, saunters over and sticks her little face into the water dish, pushing Neva’s face out. Neva will sit back, panting like crazy, patiently waiting for her little sister to finish before she even considers getting near the water dish. But more than that, Yuki and Neva have become pals. I’ve caught them hanging out together with greater frequency and sometimes in the mornings, they both hop up onto the bed with us and it feels… peaceful. It feels right. 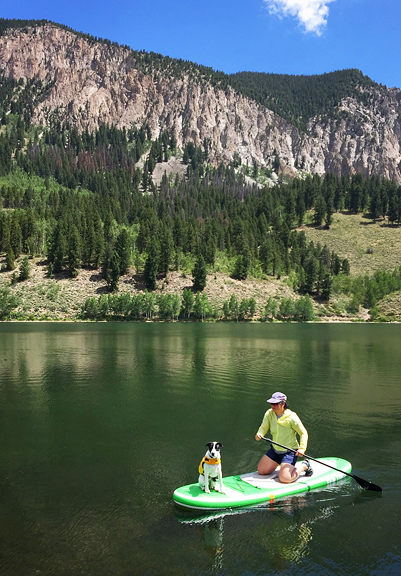 This past week the girls went out for several hikes and Yuki practiced overcoming her fear of strangers and other dogs. When Yuki is uncertain, she backs up and growls or even barks. But instead of letting her cower and be antisocial, we ask the approaching hikers if it is okay for Yuki to say hi to their dogs or to them. Once she sees that these people and/or pups are friendly and not so scary, she perks right up. She’s building her confidence, which is great. 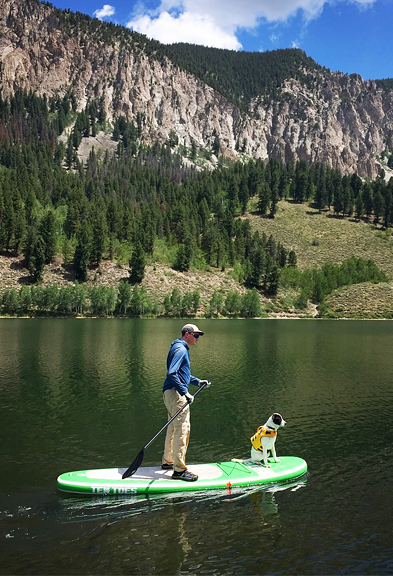 We also got Yuki out on the standup paddleboard to see how comfortable she felt on the water. Yuki is a little champ with lots of hidden talents. We are now just over a month into summer and it is starting to taste like true summer with all of the berries, peaches, tomatoes, corn, zucchini, melons, and cherries in the markets. It’s a good time for fruit pies. 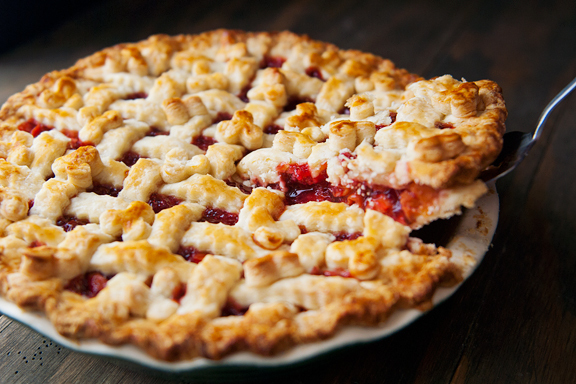 Now I love me a good pie, but for the longest time I didn’t make pies because I couldn’t get the pie crust right. A few years ago, my friend gave me a big bag of frozen pitted sour cherries. 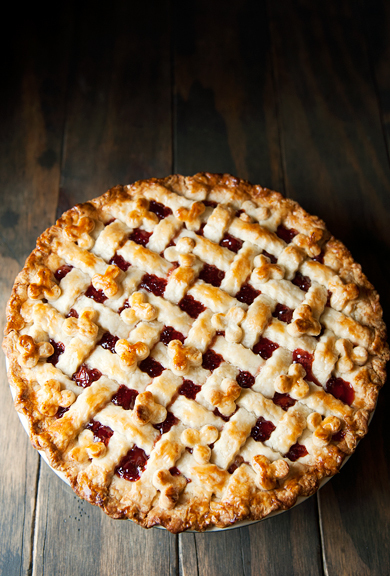 She said, “Make a pie or something!” I kept those cherries in the freezer until last year when I finally found a great pie crust recipe that is consistent, easy, flaky, and delicious. It’s great because I haven’t managed to screw it up yet! 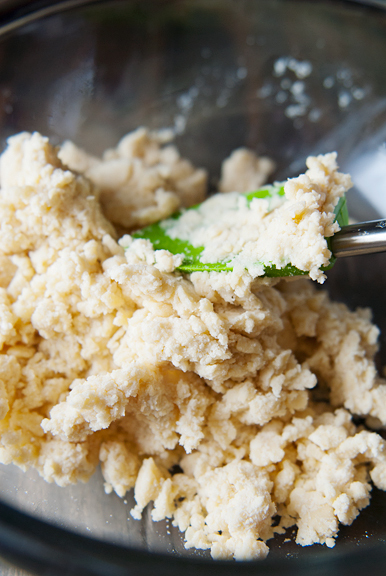 Make the pie dough first because it has to chill for a couple of hours. While the dough firms up in the refrigerator, you can start on the filling. 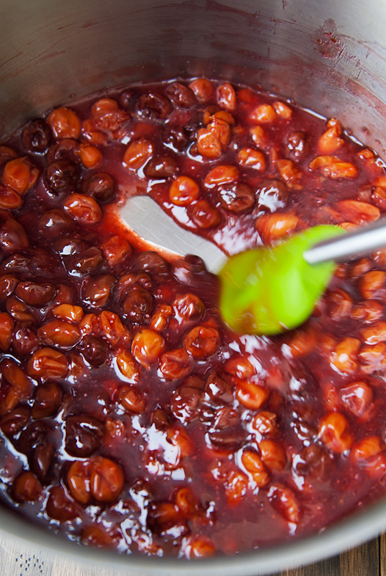 The filling is made up of cherries, sugar, lemon juice, salt, and tapioca starch. I didn’t have tapioca starch, so I used quick cooking tapioca pearls (which I don’t recommend). The cherries can be fresh or frozen. 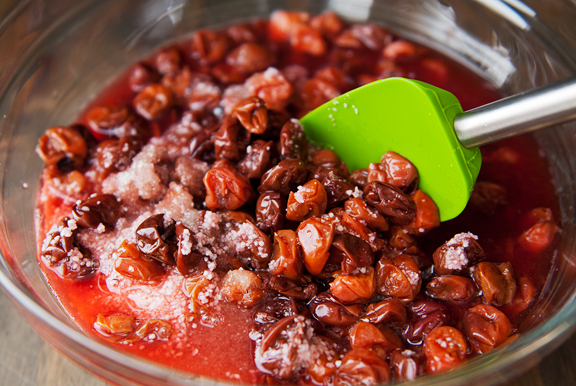 If using frozen cherries, let them thaw to about 50°F and reserve all of the liquid that collects. I was worried that I had too much liquid and that the tapioca pearls wouldn’t cook enough during baking, so I cooked the filling for 15 minutes to reduce the liquid and firm up the filling. 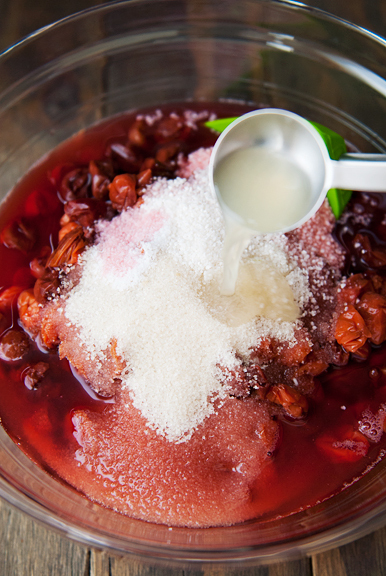 I think if you were using tapioca starch with fresh or frozen cherries, you’d be fine to skip simmering the filling. As the filling cooled, I rolled out my pie crusts: a solid sheet for lining the pie plate and then some fun with my attempt at a lattice top. I like to roll my pie dough out between two sheets of plastic wrap to keep it from sticking to my rolling pin or the work surface. It eliminates the need for added flour. When the dough is about 1/8 inch thick, I peel one plastic wrap sheet off, then invert the dough into my pie plate and peel the second sheet off. 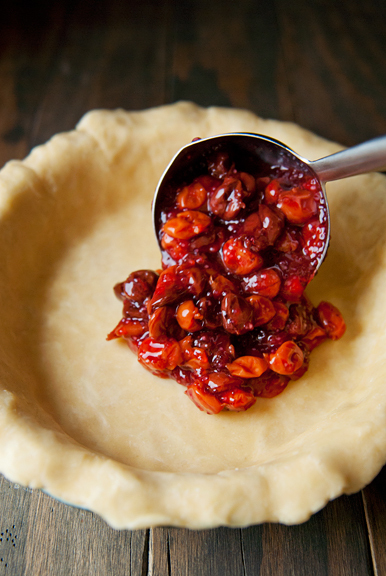 Gently press the dough into the shape of the pie plate and then pour in the filling. If your top crust completely seals off the pie, be sure to cut some steam vents into the top. The pie gets a half hour of chilling in the refrigerator, which is plenty of time to get the egg wash ready and the oven preheated. 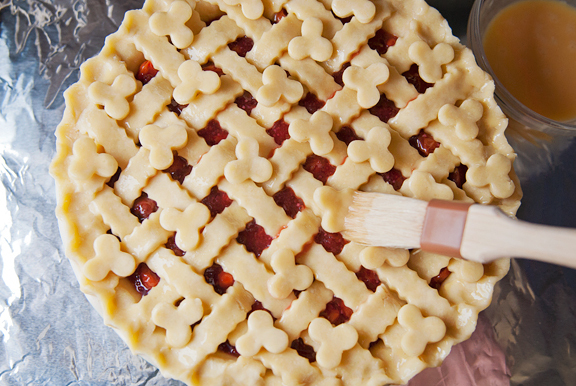 Brush the egg wash over your pie crust and then pop the pie into the oven for an hour or so. I used a foil tent to prevent the crust from burning in the last 15 minutes, but in the future I might just wrap foil around the edges and let the center brown a little more. 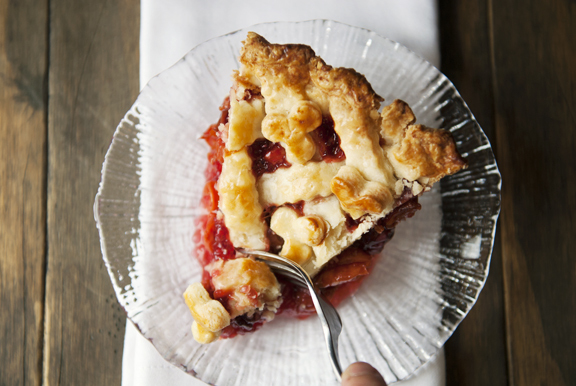 The two things that really make a great fruit pie are: an excellent flaky, flavorful crust and delicious, ripe fruit. It’s so simple and yet it eluded me for quite some time, until now. I no longer worry about wasting good fillings on unreliable pie crust recipes which means more pie in this world. And how can that be a bad thing? 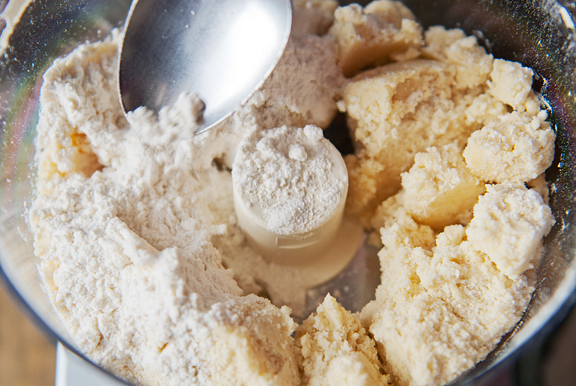 Make the pie dough: Combine 1 1/2 cups of flour with the sugar and salt in the bowl of a food processor. Pulse to combine. 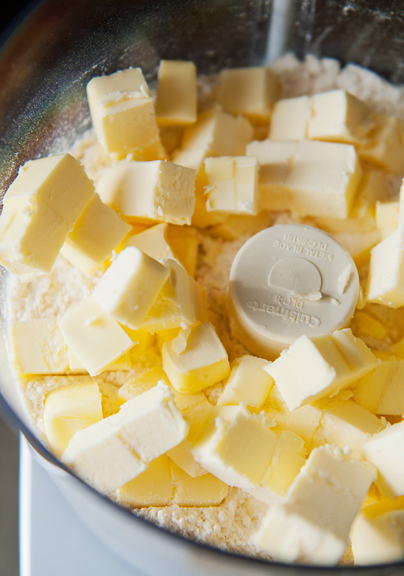 Scatter the butter over the flour mixture. Pulse about 25 times or until the dough clumps together. Sprinkle the rest of the flour (1 cup) over the dough and pulse until the flour is just cut into the dough (about 5-10 pulses). 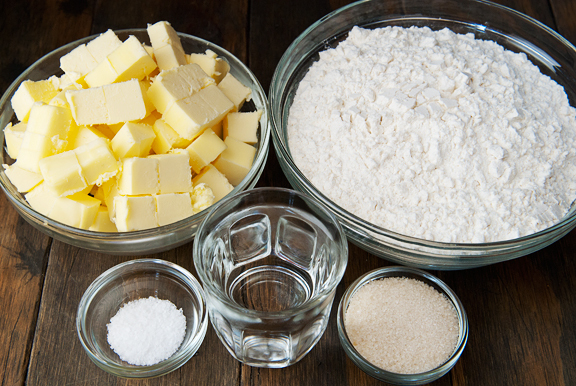 Pour the dough into a large bowl and sprinkle the water over it. 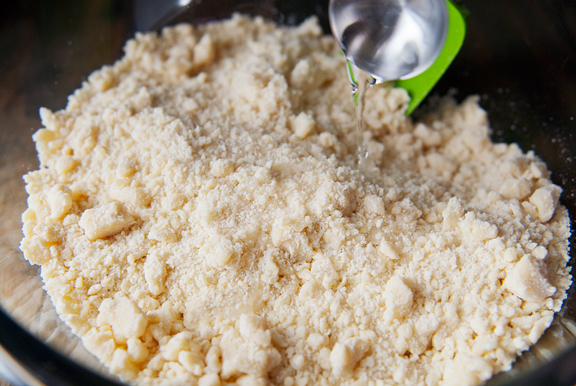 Using a spatula or spoon, fold the water into the dough until it begins to form a shaggy ball. Cut the dough in half and shape each half into a disk about 4 inches in diameter. Wrap in plastic and refrigerate for at least 2 hours before rolling. 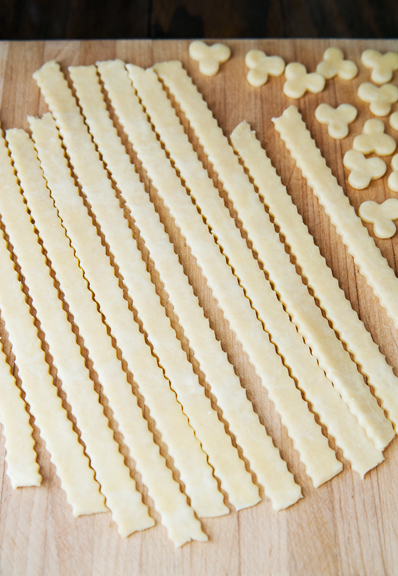 Roll each disk of dough out to 1/8-inch thickness. 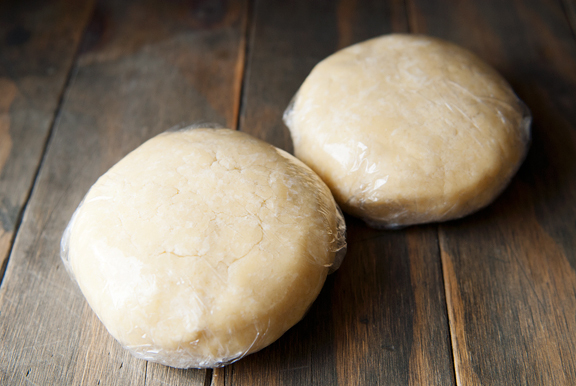 I like to roll my pie dough out between two sheets of plastic wrap. 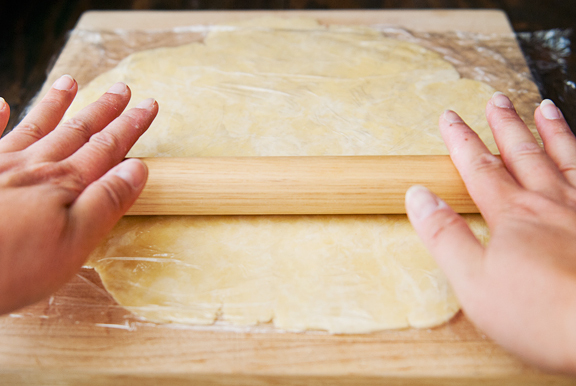 Line your 9-inch pie dish with one of the pie dough sheets, gently pressing the dough into the form of the dish. 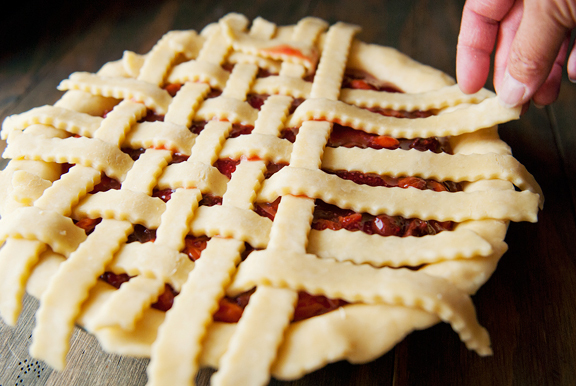 Assemble and bake the pie: Pour the filling into the prepared pie crust. Top the filling with the other pie dough sheet and seal or crimp the edges. Cut vent holes into the pie crust. Refrigerate the pie for 30 minutes. Adjust your oven rack to the lower middle of the oven and preheat to 400°F. 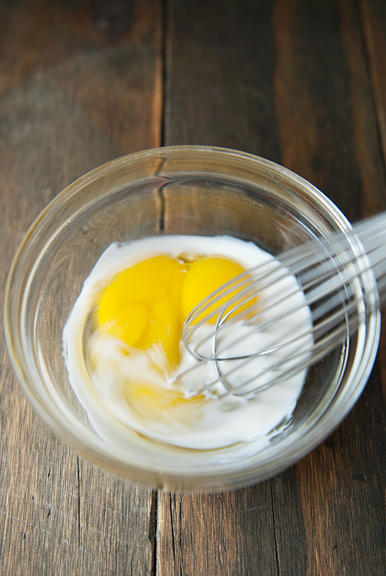 Whisk all of the egg wash ingredients together in a small bowl. Set the pie on a rimmed baking sheet and brush the top of the pie dough with egg wash. Bake for 1 hour. Place an empty baking sheet on the upper rack above the pie or use a loose foil tent to prevent burning of the crust. Bake 15 minutes more until the center is bubbling. Remove from oven and let cool to room temperature before serving. Makes 1 9-inch pie. I’ve followed you for a long time, and I’m so glad to read about Neva and Yuki. My own pup is currently at the end of days. Reading about them is a balm right now. Thank you for sharing. 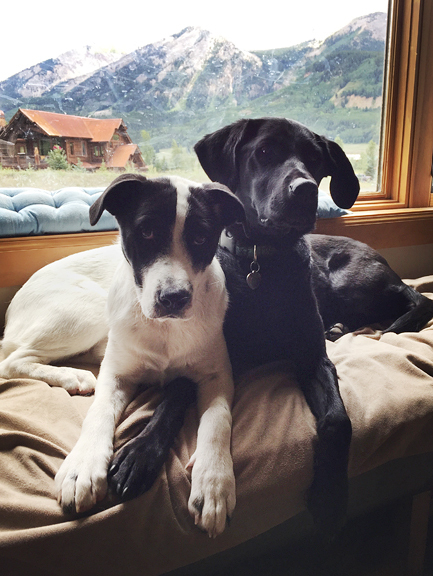 I really loved this post, especially the photos, from the pups to the pie. It’s so heartwarming to see your girls bonding. Please keep up the good work! 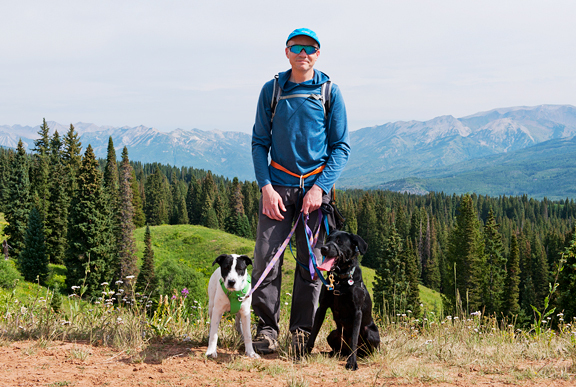 I live in Florida and seeing these gorgeous shots of your Colorado mountains makes me feel a tiny bit cooler. With all of the news I don’t enjoy hearing these days, it is so wonderful to see Neva and Yuki good news stories. I am so happy that adding Yuki to the family has been such a great thing. The pie looks yummy. My weird husband doesn’t eat fruit, and my weird kids love fruit, but only in its natural state. BUT, my son told me that he and his girlfriend made apple pie this month, and he ATE it. I will definitely be making a pie over the holidays! I love dessert. Any kind. 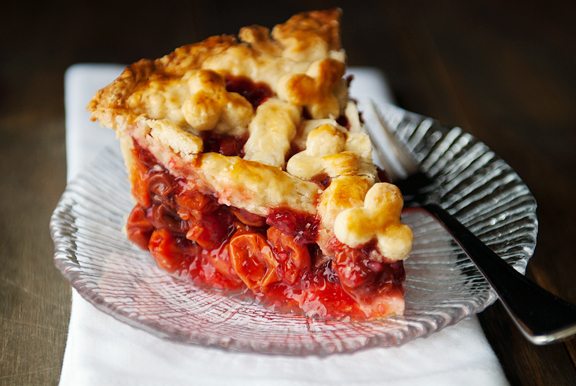 But sour cherry pie is my absolute FAVE and lucky for me this year, I put about 30 pounds of cherries in my freezer. PIE FOR EVAH! So happy to know Yuki and Neva have become such good pals. We lost our sweet rescue Boxer girl 2 weeks ago and really want to get another dog so our Doberman will have a pal (we’ve always had two dogs.) This Dobie is so jealous though, so will need to wait for just the right little rescue. But seeing Neva and Yuki gives me hope! Also very happy to know you too have been intimidated by pie crust. I can bake all kinds of desserts, but my favorite is pie and the crust has always intimidated me because my past efforts have been so inconsistent. Can’t wait for it to cool off enough to bake and try your recipe! Oh your sweet pack! Two is better than one. They teach each other, play with each other, protect each other. Nothing better! She has grown! Lucky girl to have found the Darling-Yu home. Pie looks awesome doggies are adorable! One question what type of cherries did you use? Sorry just noticed you used sour cherries I was afraid of that I live in Georgia I can never find sour cherries here. Bummer. Thank you for the recipe- it looks delicious. My sour cherry tree produced well for the first time this year. Most of the cherries went into jam (OMG delicious jam) and into cherry syrup but now I’ll have another recipe for next year! I love the pictures of Neva and Yuki! In my next lifetime I want to come back as a dog to be adopted into a family like yours! Your parenting skills are exemplary! Thank you for sharing. 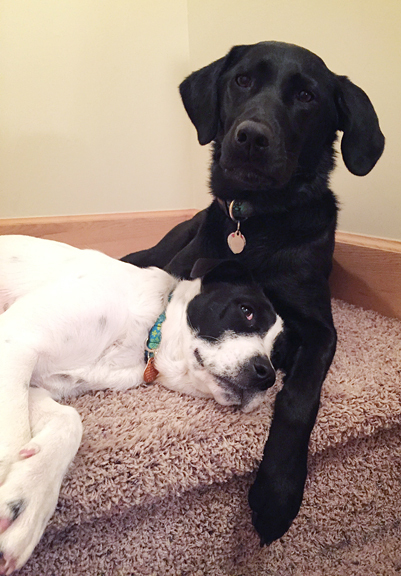 Just lovely to see Neva and her sweet sister bonding – I’m sure even moreso for you! We are who we are Neva – glad there’s peace! 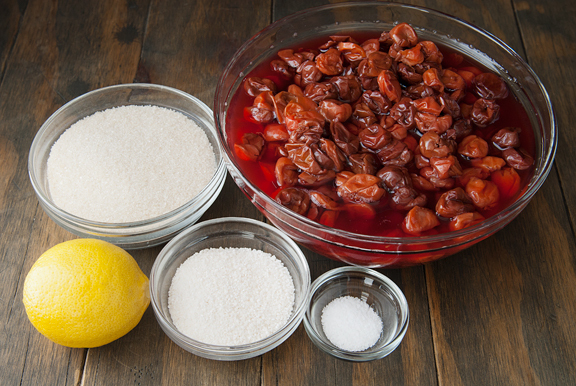 Where did you buy your sour cherries? I live in Boulder and can’t find fresh like I used to in nyc. Thanks and have fun with two! Oh – those dogs. Love it! Your blog is such a pleasure with the gorgeous pictures of CO and the dogs. I love cherry pie and I’m glad to see someone else knows the joy of making it with a food processor. I never see frozen cherries in stores and the canned is subpar, but I have found that Cherry Stop in Traverse City, Michigan will ship frozen cherries. I buy ten bags at a time and they last me about two years. Deborah - Thank you! And I hope you ARE feeling cooler. We've been experiencing hotter than usual summer temperatures here - I don't know how you Floridians do it! Glenda - I'm so sorry about your girl. Dogs are such a special part of our lives. I do hope you find a good fit for your sweet Dobe <3 And I'm anxious for cooler weather, too, because I am definitely making more pies! Patty - I honestly don't know where to source sour cherries around here. These were given to me by my friend. However, Angela commented below that Cherry Stop in Traverse City, MI ships frozen cherries. So that might be a solution! Irene - They were given to me by my friend. I *think* she got them from Pueblo, but I don't know for sure. Angela's comment below lists a source in Michigan that sells frozen sour cherries (Cherry Stop). 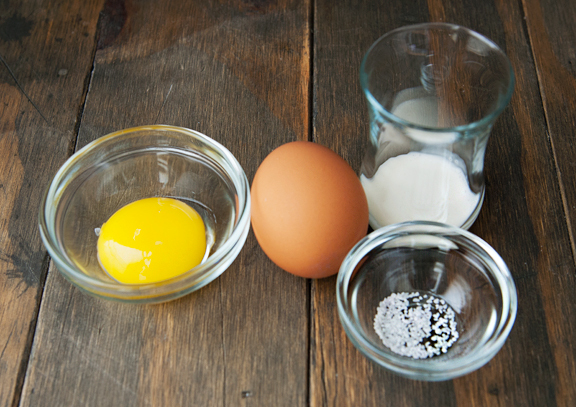 Oh yeah…my daughter has a French Silk recipe that would be right up my husband’s alley…gotta try that one. I am flop over these pictures! 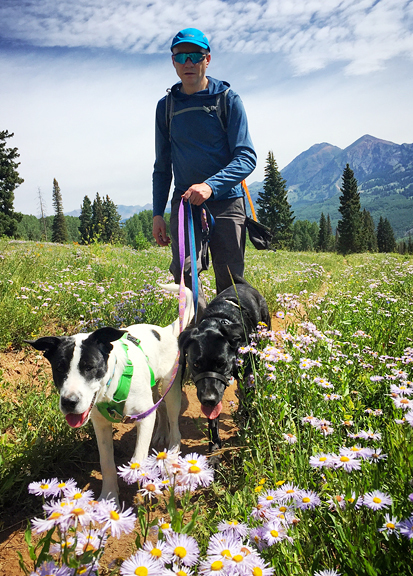 your photos of the pups are so lovely and warm and fuzzy… I think your pack is just right now and I am so happy for you that you found first Neva, then Yuki and that she “completes you (and Jeremy and Neva! )” Can’t wait to see photos and hear stories about how Yuki does with your dad! omg, those two may never separate! I’ve mentioned this before, that about 11 miles from my home (here in NOVA) there used to be a beautiful cherry orchard (and many other beautiful orchards), but urban development is spreading across our once beautiful farms and my cherry orchard is now a housing community. Thanks Angela for the tip on Cherry Stop!